Alpari is one of the world’s leading forex brokers, offering clients a full range of modern financial instruments and technical solutions for online trading and investment. The company has been operating on financial markets since 1998, developing sustainably to become an industry leader. For the past few years, the maximum annual trading turnover of Alpari companies exceeded $2.5 trillion and today, the company offers its services to over one million clients across more than 150 countries around the world. 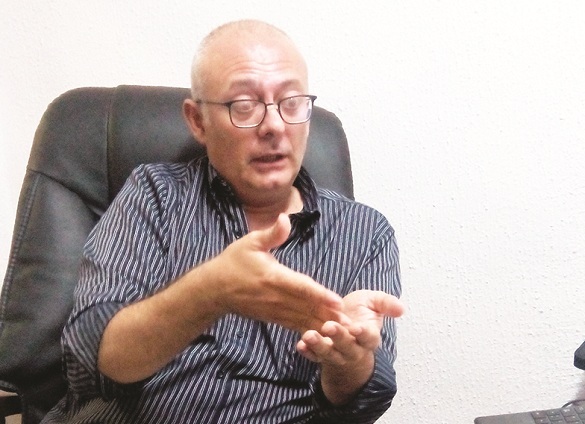 The Chief Executive Officer, Alpari Research and Analysis, Roberto d’Ambrosio, said the company is here to train many people in Nigeria to know what forex is all about and to get confidence in the business. Alpari is an international group of companies, active in the investment and forex trade industry. It’s a long lasting player in this industry and one of the biggest and has been around since 1998, a long period of time in this industry, and it has global presence. It has more than one million clients in 130 countries around the world. So we can say with confidence that Alpari is one of the major players in this industry and when it comes to Nigeria, it also has a very strong local presence with offices in Lagos and Nigeria. Alpari Analysis Company in which I’m the Chief Executive Officer, comprises a group of people dedicated to financial market analysis and research and industry trend research. We are consulted by company boards and we deliver research to not only the clients but also to the general public. We are here for the second time around for series of workshops in which we shared our views. Our company is made up of professionals. What we do is just to show people how to be professional, starting from the very basics because many people in Nigeria need to know what forex is all about and to get confidence. It is very important to know what you are handling so that you don’t make mistakes. Unfortunately, they are right in some sense because non-ethical players in the field have approached them, providing them some kind of investments in forex and promising incredible return overnight. Mostly, these people operate under a very shady company, which you cannot even identify. For instance, I am a public person, you can find me everywhere, we are public figures and if you go to our website, you will find us and you can be sure that there are people here you are dealing with. The other kind of approach is the one where they take your money and disappear. But Alpari is such a huge company that cannot disappear. It is regulated in many jurisdictions and was licensed by one of the most difficult regulators – Central Bank of Russia – and it will be licensed again in Europe. So there is a complete different approach here. In our workshops, we will never tell people to invest here, you will get double; you will never hear this kind of thing from us. We will give them the tools and teach them how to use them without making any kind of loss. Our approach is to respect the people of Nigeria, which is experiencing recession. I know that because I know Nigeria very well, since I grew up in Lagos. So we are not here to convey any kind of incredible message but to just show them what our pattern has been from the beginning, show that what we use is a platform and is the same platform they will have and it is up to them to use it rightly. Of course, for those seeking only to invest part of their money, Alpari gives responsibility to do that but always in control of the investment. They can invest, they can take up their money whenever they want, they can choose the managers to entrust their money to, so they are always in control, which is not the case with that kind investment that lacks trust as you mentioned before. Alpari is not fraudulent but comes with opportunities and interest. Alpari came to Nigeria in May 2014 and is growing. People are beginning to understand that this is not a game but an investment, a way to diversify their investments and also pursue the opportunity to become traders themselves. So they need some education; this is what we are doing here – to deliver knowledge and education. This is the core part because many times, all the misunderstanding comes from the fact that you are not completely aware of what you are doing because if you know, then your choice will be based on what you know. If you just choose because somebody is lying to you, that is where the problem comes but given the right education, one could make the right choice. We at Alpari Research Analysis want to spread this knowledge as much as possible. It is done under Alpari broker here and we came through that and it is open to everybody. We have been very clear in our communication online and we encourage people to come and they can register the same day as well, so it is open to non-clients and everybody. Of course, you cannot come and say it you’ve got all the knowledge even if training will last for up to five hours or even more. But we have a training room so people can continue once they decide Alpari is their partner. They give a lot of education about what forex is, how to use tools, the platform, what kind of trading you can do and we have the training room here with organised courses. So they can access Alpari Research Analysis channels on YouTube, where we do a lot of education and analysis. We are also on twitter and facebook. Forex is a tool basically for somebody to earn an additional income. So we teach people with various forex tools to earn additional income for themselves whether you are a businessman, working class or anybody. It solely depends on whether the states or the Federal Government will give us opportunity to partner with them. At Alpari, we are promoting free education, enlightening people. So far, we have done some training with some companies here in Nigeria to educate their staff. We also partner with Oracle Nigeria; we are doing some presentations with them and also with MTN. So there are lots of partnerships we can offer. There is very deep and detailed conversation going on right now and that is why we are inviting people to our seminars and workshops to give them that knowledge. With that knowledge, they can make a choice. We are always telling our clients the truth about forex trading. I will advice you to do a proper learning to attain the knowledge and once you acquire that knowledge, you can be participating and you can be practicing on our domain account. On the domain account, you are not investing real money, you are using the visual money to trade but when you feel you are confident enough, you can then start as low as N1,000 or any amount. You are using a none account because when you make a deposit in naira, we are converting your naira to the US dollar so that you can have access to the international forex market, which will enable you to trade. And here, you can start with as low as N1,000.